Takeaway: With a glut of information and experiences about vertical farming crowding farmers on all sides, it can be hard to separate the wheat from the chaff. Amy M Story from Bright Agrotech is here to help. Vertical farming can be a confusing space. There are hundreds of farms having a go at farming, dozens of methods being used, and endless voices discussing, questioning, and criticizing. With such a variety of vertical farms being started, it is difficult to sort out the best practices. It’s nearly impossible to wade through the forums, YouTube videos, and case studies to figure out what works and what doesn’t. This leaves many aspiring farmers left wondering what they can actually do to ensure their farm’s success. Although many have discovered good practices, many farmers overlook one enormous factor of a successful vertical farm: economics. This leads to mistakes like starting a farm without market research, choosing crops with no demand, or creating a system with crippling labor costs. Over the years, we’ve had the privilege of walking many farmers through the start-up and scaling phases of their businesses. Since starting in the industry nearly a decade ago, we have discovered that categorizing farms by the orientation of the growing plane (horizontal or vertical) completely transforms the approach for each factor. Some farmers stick to the horizontal growing plane and create vertical farms by stacking one plane on top of the other. Others break the mold and rotate the plane vertically to grow their crops. The most obvious advantage of vertical plane production is that it maximizes space use. Vertical farming not only uses one layer of the growing space, but utilizes the entire volume of space, from the floor up. 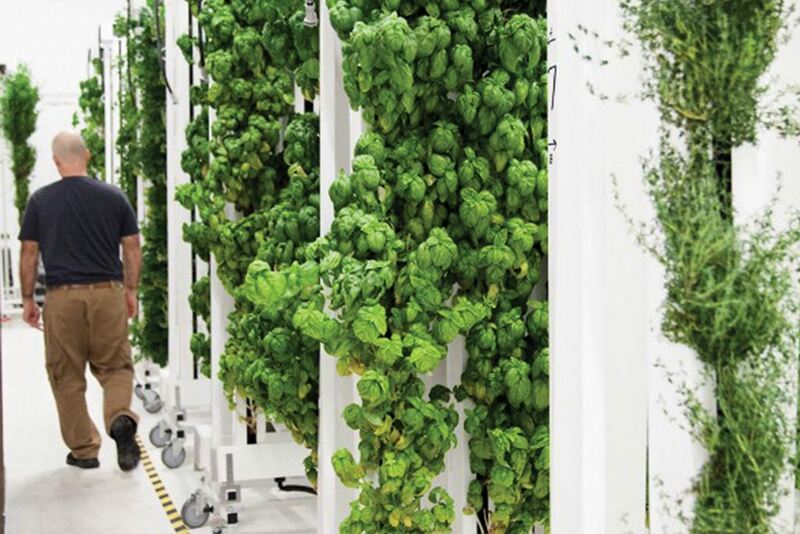 Both types of vertical farm aim to increase space-use efficiency by using a volume of space. However, the first iterations of vertical farms—stacked farms—forgot to pair space use efficiency with usability. As a result, many a stacked farm has failed, weighed down by usability and air movement issues. To remedy the problems experienced by stacked vertical farms, equipment designers began considering vertical planes. The first area brought into consideration was the amount of usable surface area in a volume. To maximize space use (expressed simply as density), growers must maximize growing surface area within a volume (growing specific surface area). In horizontal plane growing such as stacked systems, only one side of the plane is usable. Plants can’t grow upside down very well. They can grow on top, however, and they can grow on vertical sides. Stacked systems waste one side of the growing plane. Look at a horizontal growing plane. You can only use one side of the plane. Growers have only partially redeemed the wasted space by hanging lights on the other side of the plane, but ultimately are limited in their growing space. Flip the horizontal plane on it’s side, however, and you now have a more usable growing surface area. Usable growing space isn’t the only important factor in space use efficiency, however. Farms require both growing and access space; these areas are two more opportunities for growers to think strategically about how their farm is set up. Stacked production should configure both growing space and access space separately, while vertical production combines growing space and access space into one. Crunching the numbers? Quantify wasted space and space use efficiency with a ratio that compares production space to floor space. To reduce labor costs, a farmer should maximize both the ease with which workers can access crops, and the number of workers that are able to access a layout simultaneously. This cuts out waiting time and increases efficiency. Labor accounts for much of the cost of production. Streamlining and simplifying the process will have a tremendous impact on labor costs, especially in larger facilities. safeguards are easier to create and maintain, because all processes can be applied in a very targeted way. What if we started treating vegetables, greens, and other produce like a manufactured product? If we did, the product would be moved to and through processes like planting, trimming, pest control and maintenance, harvesting, etc., instead of staying stationary and having those processes brought to the product by workers. In a typical greenhouse, workers and processes move to the growing area. In a manufacturing process, the product is moved from process to process until it is done. Vertical plane growing also streamlines the maintenance process. In vertical plane farms, workers can see and identify problems easier than with horizontal plane production. Workers can also physically access and treat problems easier with vertical plane production. It’s important that your workers are enabled to easily interact with the plants, because workflows and ease of labor affect product quality, and ultimately profit. This introduces “opportunity costs”—the costs of the tasks not done. For example, if a worker skips monitoring the top levels of a vertical farm, a fungal pathogen may go unnoticed for longer. This causes crop losses, and inventory is lost. Any business owner, manager, employee, etc. knows that when a task is very inconvenient, corners are cut. If it’s difficult for people to do things, they won’t do them, and quality suffers as a result. This friction makes labor quality a product quality issue. A false assumption prevalent in the vertical farming industry is that more volume equals more profit. In reality, more volume is not always better. Filling a volume of space with growing equipment a more complex goal than just getting as much equipment in there as possible. How you fill your space dictates labor costs. If done poorly, then more volume could represent costs rather than profit. Vertical plane production sets fewer limitations on the ability to fill up a volume of space, as a function of labor use. Most commercial horizontal plane growers use six to seven tiers, but horizontal plane production typically breaks even around the fourth tier, with each additional tier losing money as costs accumulate. This is not because building tiers higher costs more; the reason for this is that the cost of labor for taking care of those higher tiers increases with each tier. In other words, capital expense might not change much with more tiers, but operational expense does. Combine these facts, and you’ve got a situation in which the law of diminishing returns is evident. As you build a horizontal plane operation higher, for every dollar invested, the return on investment shrinks. "Most commercial horizontal plane growers use six to seven tiers, but horizontal plane production typically breaks even around the fourth tier, with each additional tier losing money as costs accumulate." You can see this by examining the typical productivity. Net margin decreases by tier, finally dipping below the market standard. You might still be making a margin at this point, but if faced with pricing pressure from your competitors, you will lose—you will not have the room in your margin to lower prices. Heat is removed more easily through vertical space. Lighting interacts with plane orientation and affects airflow. Historically, lights have been attached to the growing plane itself. While overall revenue increases as tiers are added to a system, associated costs grow as well. Often, costs grow at higher rates per tier than revenue. This limits airflow, which is needed to remove heat produced by lights, remove humidity, and circulate gases such as CO2. An alternative way to arrange lights is by placing them in the center of a chimney. This facilitates instead of blocking airflow. Air can be moved less aggressively than in horizontal plane production, which requires more intensive equipment and ventilation systems. Airflow is responsible for heat removal, humidity removal, and CO2 penetration to the plant canopy. An efficient farm layout should facilitate air flow, not work against it. The higher we go, the more plant production problems occur. Pest issues tend to be worse (heat and humidity are typically higher) in the upper growing space, and treating those problems is inconvenient. Moreover, removing heat from stacked techniques is more difficult, which exacerbates the problem. Every farmer has a unique situation and unique goals. While stacked production almost never pans out in the long run, there is a place for horizontal planes in the farming industry. Sometimes, real estate is cheap. Sometimes, the market demands large crops or root crops that aren’t suited to vertical plane production. In cases like these, farmers must weigh all the variables to choose the production method that can offer long term success. Read more articles on Vertical Gardening.